As the US population ages, cases of Age-related Macular Degeneration (AMD) are expected to double. Right now more than 2 million people are affected by AMD. Although AMD is the most common cause of eyesight problems in people over 50 years old, it doesn’t affect peripheral vision or lead to total blindness. Even if your eyesight is affected, there are lots of ways can maintain your quality of life. As the name suggests, in age-related macular degeneration the cells of the macula wear out. The light detecting layer at the back of the eye is called the retina, and this is lined with cells called rods and cones. Rods are mostly at the edges of vision and are good for peripheral vision and night vision. Cones detect color and sharp detail and are most densely packed in the macula – the central part of the retina where best vision occurs. and a ‘blind spot’ in the middle of vision that gradually gets bigger. 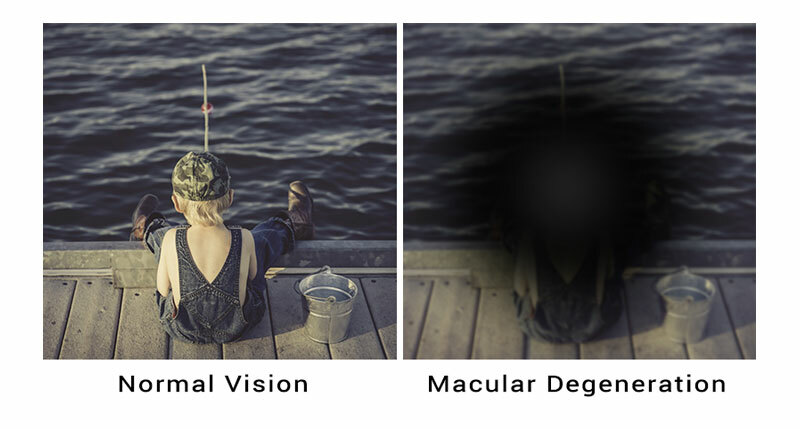 About 90% of people with AMD have ‘dry’ AMD, in which the cells of the macula just wear out. While it can’t be treated, it doesn’t tend to be as severe as wet AMD and comes on slowly, often over many years. The wet form of the disease usually leads to more serious loss of vision. It can cause severe loss of vision within months, but it is treatable. If you’re diagnosed with wet AMD, you may be eligible for a treatment called anti-VEGF. Medicine is injected straight into the eye in a course every few weeks, using a very fine needle. The treatment sounds scary but it is done using local anesthetic drops and takes only a few seconds. This treatment is new but very exciting – while it doesn’t help everyone, up to two in five people treated see a significant improvement in their eyesight. What if my eyesight is badly affected? The world is full of adaptations if you know where to look. Large print books, big-numbered phones, and magnifying glasses make things bigger. Adjustable lights make things brighter and contrasting backgrounds make them bolder. How can I protect myself against AMD? Eat a healthy diet with lots of fruit and veg. Some vitamins may help ward off or delay progression of AMD. Don’t smoke – it can damage your eyes as well as your lungs. Avoid bright sunlight by wearing sunglasses with high level UVA and UVB protection. Get your eyes examined annually, even if you haven’t noticed any change in your vision. Many other eye problems (including glaucoma) become more common with age, and early treatment could save your sight.